Future fitness trackers could soon add blood-oxygen levels to the list of vital signs measured with new technology. There are various pulse oximeters already on the market that measure pulse rate and blood-oxygen saturation levels, but those devices use rigid conventional electronics, and they are usually fixed to the fingers or earlobe, said the researchers who is developing a new organic optoelectronic sensor. The engineers put the new prototype up against a conventional pulse oximeter and found that the pulse and oxygen readings were just as accurate. The research team reported its findings in the journal Nature Communications. 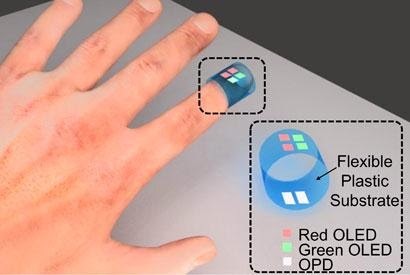 For the organic sensors, the researchers used red and green light, which yield comparable differences to red and infrared when it comes to distinguishing high and low levels of oxygen in the blood. Using a solution-based processing system, the researchers deposited the green and red organic LEDs and the translucent light detectors onto a flexible piece of plastic. By detecting the pattern of fresh arterial blood flow, the device can calculate a pulse. The researchers added that because the components of conventional oximeters are relatively expensive, health care providers will choose to disinfect them if they become contaminated. In contrast, "organic electronics are cheap enough that they are disposable like a Band-Aid after use."